Adding an elegant new twist to the classic eternity design, this braided ring represents how our lives are connected. With its refined look and feminine pink hue from a unique blend of metals, it will add stylish details to your outfit. This fashion staple is available online and in concept stores. PANDORA Rose Braided Pavé Ring is rated 4.4 out of 5 by 52. Rated 2 out of 5 by Nicole3 from twist of fate I recently purchased Twist of Fate, Pandora Rose gold ring. It was ordered on 2/5/17 and shipped on 2/6/17. Within the first 3 days of me having and wearing the ring, a stone has fallen out. I am wondering how to get it replaced. I tried calling multiple times, and could not get through to a REAL person. I emailed the company on 3/4/17, and received an email saying they would do their best to respond in 3-5 days. It has been 6 days, and still no response, and I STILL can not get through to a REAL person. The ring is gorgeous, and was a surpise/present, from my husband, who is currently over seas. I would like to be able to enjoy looking at it, without it having a missing stone. The ring and design is gorgeous, but I am disappointed in how easily it had a fault. 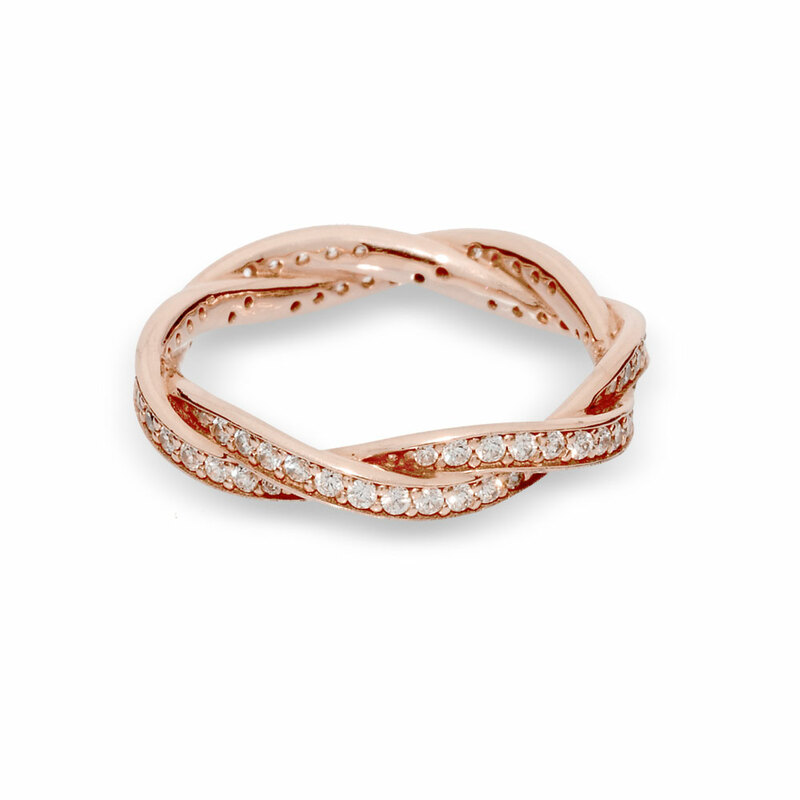 Rated 1 out of 5 by Kelly1718 from Rose Gold Gone I got this ring as a gift last year in December. I absolutely love this ring and have taken care of it well. Unfortunately almost all of the rose gold has rubbed/chipped off and does not look anything like the picture anymore. I have only used it for every day wear and not under rough conditions whatsoever. I am so disappointed because of how beautiful it used to look when I first got it compared to now. I will continue to wear it since my boyfriend got it for me, but I am still so disappointed. Rated 5 out of 5 by Babcia2012 from Exquisite! Love it, love it, love it, love it!!! !...Even being self-conscious of my short nails....Love it, love it, love it!!! Rated 5 out of 5 by lauraj26 from Sturdy! I got this as a promise ring, and even though my job can be tough on jewelry, it has held up beautifully. Sparkles and shines, with a delicate, feminine rose color. I get many compliments on this ring! Rated 5 out of 5 by Pandorajunkie21 from Soooo pretty!! I'm in love with the craftsmanship of this ring. It's absolutely stunning. I wear this on my pointer finger and the vintage elegance on my ring finger. I'm so glad I made this purchase it's definitely worth the money! !